Ready to fill your Colorbok Perfect Scrapbooks just a little fuller? 12"x12" scrapbook refill packs from Colorbok are now available. Each page protector is made from optically clear, archival quality, polypropylene film to ensure your photos will last forever! 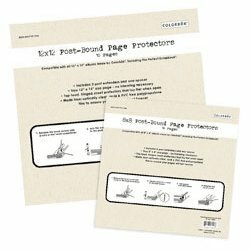 10 top-loading page protectors (album refills) with three post extenders and spacer per pack Compatible with all 12"x12" albums by Colorbok.